Bouabdallah, M. 2018. Ibn Taymiyya wa 'asruhu ابن تيمية وعصره (Arabic Translation to "Ibn Taymiyya and His Times"). Beirut, Lebanon Arab Network for Research and Publishing. Taqi al-Din Ibn Taymiyya (1263-1328) is one of the most controversial thinkers in Islamic history. Today he is revered by what is called the Wahhabi movement and championed by Salafi groups who demand a return to the pristine golden age of the Prophet. His writings have been a source of inspiration for radical groups to justify acts of violence and armed struggle. In order to understand the widespread present-day influence and prominence of this rather obscure medieval figure, the book, through a series of articles written by leading authorities in the field, attempts to study Ibn Taymiyya's original contributions to Islamic theology, law, Qur'anic exegesis, and political thought. The book is the first comprehensive academic treatment of Ibn Taymiyya to appear in a Western language in over half a century. 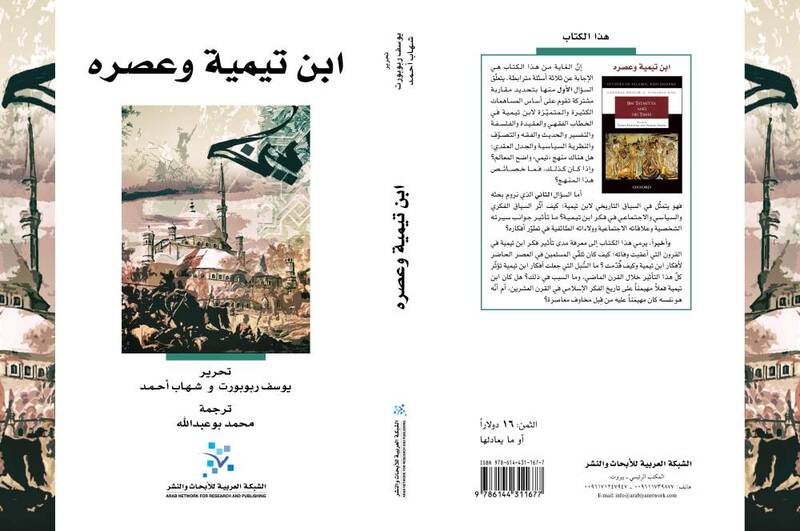 Bouabdallah, M. 2015. al-Nnaz'a al-Naqdiyya 'nda al-Ibrahimi (The Critical Thinking of al-Ibrahimi). al-Ibrahimi wa aafaaq al-Hadatha (al-Ibrahimi and Moderninty) . Algeria 10 Apr 2015 Algerian Association for Philosophical Studies.